Not a moment to spare this hectic holiday season? 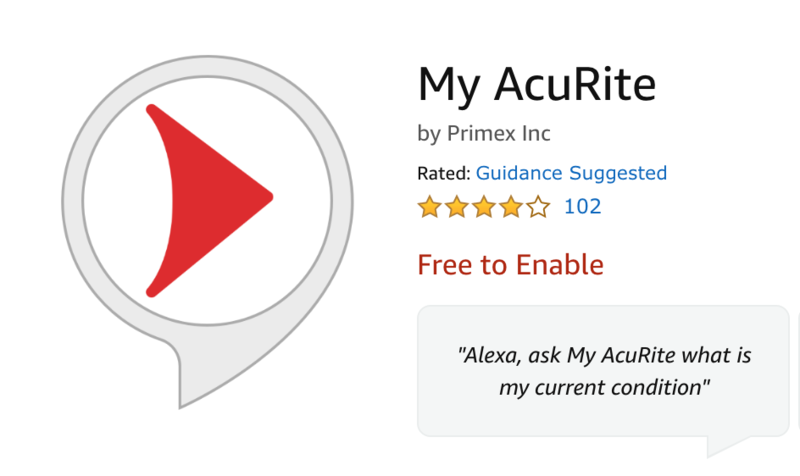 While the AcuRite Access can’t cross things off your to-do list, we can save you time with a more flexible and faster way to get your environmental monitoring data with an Alexa upgrade. Several savvy AcuRite weather enthusiasts alerted us to their frustration of listening to a laundry list of sensor readings. Many suggested we unbundle those environmental sensor calculations and give Alexa the ability to provide specific readings upon request. Our development team thought that was a great idea and got right to work. The result? A slick new upgrade that gives end users the flexibility to get only the weather readings they ask for – both indoor and out, at home or away – upon voice command. In addition to providing readings at your request, Alexa will also now notify you of any active alerts you have programmed. So if you monitor for freezing temperatures, excessive wind or rain, or lightning, Alexa can tell you which alerts have been triggered. Just say, “Alexa, ask My AcuRite for my active alerts.” Also, indoor conditions can be monitored as well, so you’ll always know if the temperature and humidity levels in your home are just right. Before you get totally swept up in holiday madness, enable your My AcuRite skill, rated four stars on Amazon and compatible with many AcuRite products, including the new AcuRite Atlas. As always, thank you for the feedback and we hope you enjoy the updates! How does it work with multiple bridges, ie, multiple homes? Currently the Alexa skill is not able to give the sensor information from different locations. We will pass your feedback along to the proper team for consideration on future updates. Wonderful improvement! Is there anyway to specify which location you want reported, I currently have 4 weather stations installed along with 6 of the temperature/humidity sensors, my Alexa seems only to report the First (left most) location that is shown in MyAccurite app. Since that happens not to be the location I’m currently at, it limits the usefulness of the skill at the current time. I received my AcuRite for Christmas and I love it. All I had to do was install batteries and it did the rest. It works perfectly. We are so happy to hear that you are happy with your AcuRite product. Sounds interesting, but what about Google Home customers? Will it work for them? Currently AcuRite Access will not work with Google Home. We recommend signing up for emails so that if it does become available, you will be notified. I have 4 different Accurite 5-1 Weather stations at 4 different locations, The current system simply picks the first location and will give me info on that location. Since I’m not at that location, the skill is nor very useful to me. If you could allow us to pick the location for the skill to use, it would be a wonderful addition. We appreciate your feedback and will pass this along to the appropriate team for future consideration.